A playful co-op experience that shines with mates, but isn’t as precise or polished as a mainline Zelda. Before the looks-conscious Tri Force Heroes, The Legend Of Zelda series was never a dedicated follower of fashion. And why should it be? This is one of gaming’s formative adventures, its timeless elements reworked across generations. It being in thrall to fads would be like your grandad mixing a Shearling coat with his carpet slippers in an embarrassing attempt to stay current. Thankfully, underneath its glitterati trim – its unlockable outfits, Link-stacking totems, daily rewards and in-level selfies – this co-op 3DS outing is a multiplayer puzzle-brawler built on old-school fundamentals. It’s the new stuff that occasionally comes unravelled. I like its style, though. In the opening minutes, the threadbare threat of dark sorcerers is cleverly unpicked, Ganon and co sitting this one out for the Lady, whose evil plot is to imprison an eminently coutured princess forever – in a brown unitard. The vain kingdom of Hytopia is a no less endearingly silly spin on fiefdoms in peril. The threat to the locals’ way of life? Being constantly afeared of getting cursed for looking too good. Nevertheless, the peril is real enough that off you must go, questing with two partners into the Drablands to restore all that is good-looking to the lives of Hytopia’s beleaguered souls. That’s exactly two partners, mind. It’s not quite as hard as it sounds to orchestrate: as well as buddying up online, Nintendo has generously made the whole game available to play via Download Play, or with other local players. But be warned that you can never venture forth with just one friend. If you’re in a real pinch, you can play solo by juggling your ‘soul’ between a trio of creepy, Shy Guy-masked dolls called Doppels, tapping their icon on the touchscreen to animate that vessel. Still, I wouldn’t recommend that. Why not? Well, because where Tri Force Heroes comes alive is in the gleeful chaos of trying to sync up with two other ludicrously dressed, sword-wielding buffoons, all sharing a life bar, to crack each area. The puzzles are simplified, designed to be worked out quickly, explained just as fast and then executed with teamwork and timing. So unlike most Zeldas, the hard bit isn't the figuring out what to do next, but how to get everyone to do it. And that goes doubly for online play, where communication is mediated by an excellent palette of simple but expressive emotes to get your message across. Take that interplay away and it’s just flat. It can be more fussy too: one late-game puzzle that I solved in 10 seconds with friends took upwards of 10 minutes of positional fiddling by my lonesome. While most games get better with others, Tri Force Heroes doesn’t really work without them. So it’s curious that when picking stages online, Nintendo eschews the voting and then random final selection of Download Play and asks you to join a lobby per map area. This prevents you skipping ahead to later zones, sure, but it potentially means a shallower pool of fellow heroes to partner up with. While sufficient online numbers will make all this invisible, it’s still bizarre to make lobbies so granular. Why not just limit you to every zone you’ve unlocked so far? Partially that’s because, to cut down the confusion a little, every Link or Doppel can hold only one item, found on little plinths at the start of each set of four mini levels. Increasing the complexity quite a bit more is Tri Force Heroes’ signature trick: the living totem. It may sound like something unsavoury you’d find on Urban Dictionary, but it’s really just the logical evolution of an idea from Four Swords Adventures, with you able to hoist one or both of your fellow Links on your shoulders to hit high-up switches or do teetering battle with enemies. It’s a touch overplayed, especially in the starting few areas of the total eight. While the aim is to get you thinking about stacking order (you might need the bow guy on top to hit a towering switch, for instance), it’s not really until the third zone that the game calms down and lets other, better ideas get a proper look-in. It does highlight a recurring problem, though: while the analogue stick is generally fine, you have to do so many activities under time pressure, also allowing the lag time for three people to process it, that it would be a huge help if the D-pad jumped you to the cardinal or ordinal directions. It doesn’t, doing a weird camera lurch forward that I never intentionally used, and instead the game unhelpfully snaps to one of eight facings based on the stick direction when an item button’s pressed. This leads to too many unnecessarily flubbed boomerang throws and misaimed arrows. Still, once you’re over the control vagaries, there’s an awful lot to like. Chasing ghosts around in the dark for keys, jousting on statue back, coordinating precision strikes on multiple switches or barrelling in collectively to beat one of the imaginative bosses all offer charming little twists on familiar series norms. That shared life bar means that all these highlights can be ruined by bad players (or outright trolling ones), and cuts down on the flip-flopping competitive/co-op tomfoolery of its predecessor, but a generous ration of level skips and simple two-press banning system will prevent too much frustration. Meanwhile, despite the the worlds themselves being cliche – water, fire, ice, ghost and sand – the presentation is charming enough that you’ll barely notice how much has been borrowed from 2013’s A Link Between Worlds. Finish a collection of four levels, with four sets of four levels per world, and your rewards are duds. Well, materials to make new duds with. These can be, ahem, fashioned into a vast wardrobe of different outfits, each with a perk. Some are difficulty modifiers, the classic Zelda dress causing more hearts to drop, and Tingle’s getup preventing fall damage. There are a few seemingly patched-in oddities, though, and none feels truly essential, except to unbalance the throwaway competitive coliseums, where two or three players do battle in little arenas for a couple of minutes. Not that the threads are the reason to play Tri Force Heroes. That would be the rush of taking down a boss with randos, using gestures and the occasional judicious throw in the right direction to nudge your team along. That would be for chuckling to yourself at the lightheartedness of it all, or the best surprises along the way. The outfits may lend a certain temporary razzle dazzle, but this old timer knows how to do co-op videogame adventuring in way that’s never going out style. 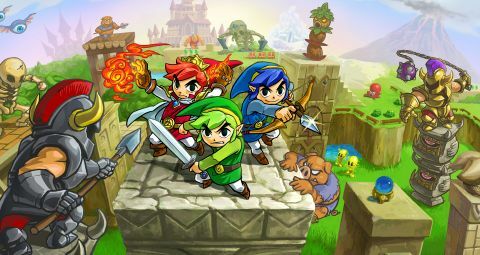 Description The classic Four Swords multiplayer Zelda template gets shrunk down to the equivalent of 'Three Swords' in this online and local co-op Zelda adventure on 3DS.